Grants for grassroots community development in urban areas can produce new forms of entrepreneurship among the poor. This column outlines how a network of slum dwellers in India has managed, invested, and revolved these grants and other funding sources, including its own savings, to leverage resources and opportunities for inclusive city development. Over a period of three decades, a network of slum dwellers living in Indian cities has taken US$19 million and turned it into development programs worth almost $100 million. They have provided shelter to 86,000 families, sanitation to over 163,000 families, and livelihood loans to around 8,500 families across 70 cities. We are talking about the Indian Alliance made up of Society for the Promotion of Area Resource Centers (SPARC), the National Slum Dwellers Federation (NSDF), and the Mahila Milan. NSDF was established in 1975 to fight evictions from slums. They sought a partnership with SPARC, a non-governmental organization formed in 1984 to work with the poorest women in cities, and Mahila Milan, a network of poor women’s collectives set up in 1986. 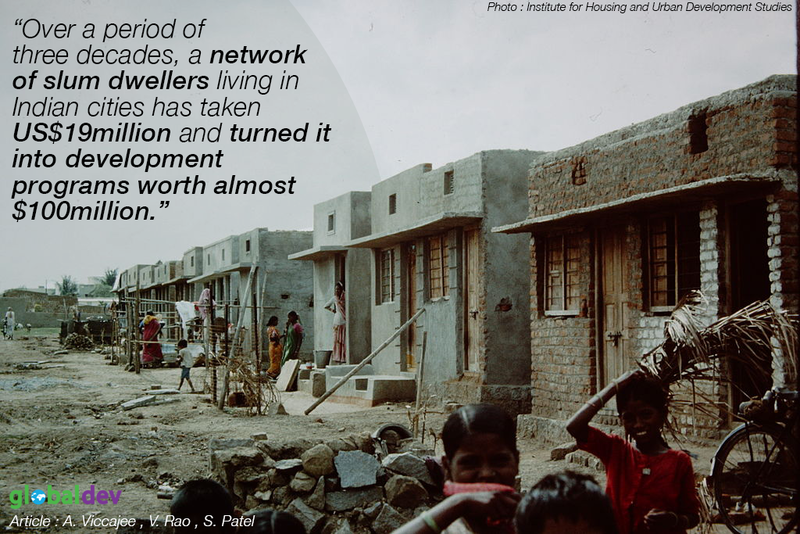 In a recent research report, we explain how the Indian Alliance has learned how to take money from governments and donors, and invest it to make more money for slum upgrading. We know that it’s not how much you get, but how much you make it work for you. The Indian Alliance has one priority: building the capacity of local communities and increasing their networks in cities. We do this by helping poor women to save, and training communities to collect data about themselves, their families, their settlements, and their cities. These processes are the building blocks of all our work. They are important investments, which enable us to generate returns and make sure projects become sustainable. We aim to support precedent-setting projects. For example, the Indian Alliance has built community toilets in Mumbai and its adjoining areas, which serve 750,000 people. A set of imaginative design choices by the communities made sanitation access more equitable, affordable, and convenient for dense urban settlements. These toilet blocks caught the attention of state agencies and broke the stereotype that poor communities are mere beneficiaries. Precedent-setting projects help us to capture the state’s attention when simple negotiation doesn’t work. We have found that if we want good sanitation, safe drinking water, or decent housing, we have to show the state what we want and that we can help to deliver it. Our precedent-setting projects show that the urban poor are collectively able to help the state deliver housing and sanitation programs. They have allowed the Indian Alliance to initiate closer, more defined negotiations between communities and state agencies. Many state agencies now recognize the need to involve slum residents and to collaborate on solutions that work for the residents. While deep community engagement can be challenging, governments find that projects are difficult to deliver and hard to maintain without it. The Indian Alliance now has a number of contracts with the state, which reimburses us for any payments. But a reimbursement basis means that – no matter what the size of state projects is – repayments from the government take time. Sometimes, projects only begin paying us back several years after implementation. We therefore have to find bridge funding to pay the upfront costs. This has required some sophisticated financial skills. We initially received generous grants that we used to cover our costs until the state subsidies came through. But after the projects were completed, the money was repaid – sometimes with interest. We have used these returns to set up a revolving fund. The Indian Alliance draws on this revolving fund to pay the upfront costs of new projects, which are again repaid with interest. So a grant is recycled again and again through the revolving fund, allowing us to build many more houses and toilets than if we had just spent it all once. As we have grown larger, it has become clear that we can’t just depend on grants. The Indian Alliance therefore began borrowing from banks to cover our upfront costs. This required innovative ways to reassure the banks that we would repay the loans: our donors generously helped out by providing letters of credit and guarantee funds. While borrowing money has been complicated, it has allowed us do much more, much faster. We have also taken on large construction projects, where real estate developers enjoy financial and non-financial subsidies in return for providing affordable housing. For example, developers might get permission to build a taller block of apartments if they guarantee that a certain number of those apartments will be given to slum dwellers. We are now involved in projects that a mid-size construction company might take up. So we have built partnerships with construction companies that have more expertise and are willing to take more risks. The Indian Alliance continues to focus on our one priority: community participation and capacity-building. But thanks to our precedent-setting financial experiments, we jointly own the construction projects and share the returns. We now possess a wide range of instruments for financial management and can access multiple income streams. More than ever, we are able to reach the poorest and influence urban policy. The Indian Alliance is continuing to innovate as we scale up. Watch this space. Sheela Patel is the founder and director of SPARC. She is also the chair of Shack dwellers international, a transnational network of community federations. Aseena Viccajee is currently the the associate director of SPARC. She is a part of the team that has innovated the financial products highlighted in the paper. Vinodkumar Rao works as a consultant at SPARC. He supports documenting its work and its networks.